DESCRIPTION: 50% Share Equity. A recently constructed and high end specification two bedroom apartment with the real advantages of allocated parking, good bedroom sizes an especially quiet location and - perhaps most important of all - extremely impressive views from both the kitchen and the triple aspect lounge. The lounge enjoys a Juliet balcony with views toward the front and on the two other sides uninterrupted views across farmland towards the Sussex hills in the distance. A glance at the photographs will give an indication as to both the quality of the property as well as the extremely desirable nature of such views! SITUATION: The property is located towards the very southerly reaches of the town. To this end whilst the town is some mile distant, open areas of Kent and Sussex countryside are almost immediately to hand. Tunbridge Wells itself has an excellent mix of social, retail and educational facilities including two theatres, a number of sports and social clubs, a range of multiple retail opportunities at both the Royal Victoria Place shopping centre and the North Farm retail park alongside a further range of independent retailers primarily located between Mount Pleasant and the Pantiles. The town has a number of highly regarded schools at primary, secondary, independent and grammar levels. The town has two main line railway stations serving both London termini and the south coast. BEDROOM: Carpeted. Double glazed windows to the front affording views of play areas and houses beyond, radiator, loft access hatch. BEDROOM: Carpeted. Double glazed windows affording views of play areas and houses beyond, radiator, wall mounted thermostatic control, tv aerial point. KITCHEN: An attractive and high specification kitchen with a range of contemporary wall and base units with a complimentary work surface and inset single bowl stainless steel sink with mixer tap over. Integrated electric oven, inset four ring 'Zanussi' electric hob with feature stainless steel extractor hood over. Space for free standing fridge/freezer and washing machine., cupboard housing a wall mounted 'Ideal' boiler. Inset ceiling spotlights, double glazed windows to the side affording most impressive views across open farmland and countryside towards rural Sussex in the distance. A most impressive and unexpected feature. LOUNGE: A light and airy lounge with triple aspect double glazing, this comprises a Juliet balcony with a set of French doors affording views of neighbouring properties and three further sets of double glazed views affording further excellent views across neighbouring farmland to Sussex on the horizon in the distance. A most appealing feature for a Tunbridge Wells apartment. Carpeted. Two radiators, various media points. 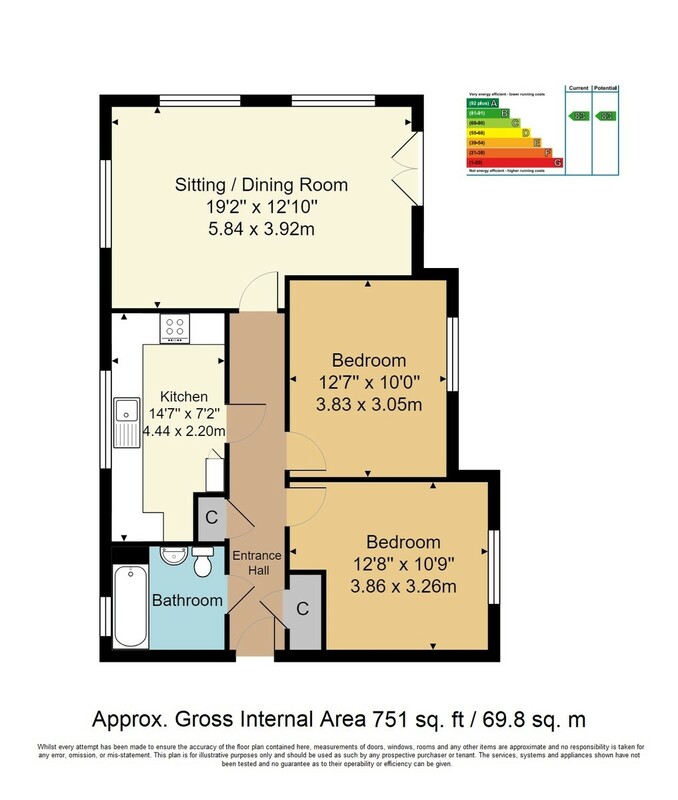 BATHROOM: Fitted with a white suite comprising panelled bath with hand held shower attachment and glass screen door, pedestal wash hand basin with tiled splashback, low level wc. Double glazed window. Heated towel rail and shaver point. OUTSIDE: The property enjoys views of communal gardens to the rear of the block and has a further use of a single allocated parking space to the front. AGENTS NOTE: This property is offered to purchase on a 50% Share Equity with Town & Country, rent would be payable on the remaining 50% at £358.92 per calendar month and a service charge of £111.06 per calendar month.